Husqvarna Vitpilen:Husqvarna Vitpilen 401 Spied With A Desi Touch! 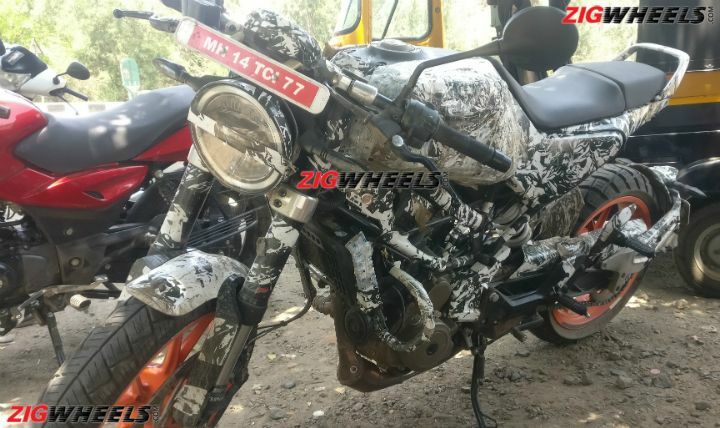 Home News Automobiles Husqvarna Vitpilen 401 Spied With A Desi Touch! 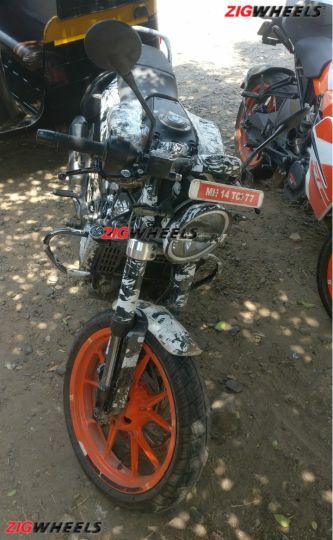 The motorcycle was spotted alongside the upcoming KTM 390 Adventure. We suspect it might be BSVI-compliant. Expected to hit showrooms by early next year. It is no secret that Husqvarna will be bringing the Svartpilen 401 and Vitpilen 401 to our shores soon. In fact, we were the first to spot them testing last year. However, things appear to be different now than what we saw earlier. This time around, it was only the cafe racer Vitpilen 401 which was spotted testing, along with the upcoming KTM 390 Adventure. From the images, the motorcycle seems to have been “Indianised” for our market. Gone are the spoke rims seen on the international-spec bike, replaced by more practical alloy wheels carried over from the KTM 390 Duke. Also absent is the single saddle unit, which has been replaced with a split seat. The orange alloys appear to be shod with MRF block pattern tyres instead of the Metzeler Sportec M5’s seen on the international variant. Then there is the addition of grab rails, which looks taken straight out of Bajaj’s parts bin. Another interesting detail to notice is the shape of the catalytic converter. It looks quite different from what’ve seen on the 390 Duke and the Euro-spec Vitpilen 401. The exhaust downpipe has been routed downwards and then towards the rear. Does this mean the bike might be BSVI emission ready? Likely. Our sources tell us the Husqvarna bikes may debut next year, which coincides with the implementation of BSVI norms. Overall, Husqvarna seems to be tinkering with the bike to make it more practical and comfortable. The grab rails and the alloys are prime examples of this. But if we had to consider the fit and finish of the body panels and the crude-looking exhaust system, we suspect it to be a pre-production model. What we do know for sure is that it is currently powered by the same 373cc single-cylinder liquid-cooled unit as the 390 Duke, which churns out 43.5PS and 37Nm and mated to a 6-speed gearbox. Braking hardware here consists of 320mm front and 230mm rear discs, with dual-channel ABS. Suspension duties are handled by WP USD forks at the front and a WP monoshock unit at the back. When launched, we expect the Husqvarna Vitpilen 401 to be priced around the Rs 3 lakh (ex-showroom Delhi) mark.